The Moneypenny Diaries: Guardian Angel has finally been released in the United States. 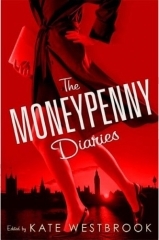 First published in the UK on 10 October 2005, the diary chronicles the life of Miss Moneypenny, M’s secretary. Guardian Angel takes place between On Her Majesty’s Secret Service and You Only Live Twice. Two further adventures have been written but have yet to be announced for publication in the United States. Secret Servant: The Moneypenny Diaries (published in the UK in 2006) and, The Moneypenny Diaries: Final Fling, which was just released in the UK this month. Two short stories were also published in 2006: “For Your Eyes Only, James” and “Moneypenny’s First Date With Bond”. The trilogy was written by Samantha Weinberg under the pseudonym Kate Westbrook (as editor). Order it from Amazon .